No greater day has ever dawned in Mississippi than this day, June 3, 1912, when the men of our great State with one accord assemble to pay homage to the women of the Confederacy. And no more appropriate date could have been selected than this anniversary of the natal day of Jefferson Davis, the central figure of the Confederacy, the incarnation of the principles for which the South stood, and the vicarious sufferer for the South when at Fortress Monroe he suffered all the humiliation and degradation that could be heaped upon him; but he was ever sustained and soothed by an unfaltering trust and rose supreme above the hatred of his enemies. In those celestial regions yonder, if it is given to the spirit eye to gaze upon earthly scenes, we know that grand galaxy of Confederate heroes, Jefferson Davis, Robert E. Lee, Stonewall Jackson, Albert Sidney Johnston, Nathan Bedford Forrest, and our own Stephen D. Lee, and a host of others, is looking down on us now with blessings and approval. Although the cornerstone was laid in 1912, it would be five years before the remainder of the monument was installed. The reason for the delay was at least in part due to disagreement among the various Confederate veterans’ organizations about what type of monument was appropriate to honor the women of the Confederacy. There was no question that recognition of the women was appropriate; after all, the UDC had erected numerous monuments to the men who served as soldiers and sailors during the war. What the veterans couldn’t agree on was what the monuments should look like. 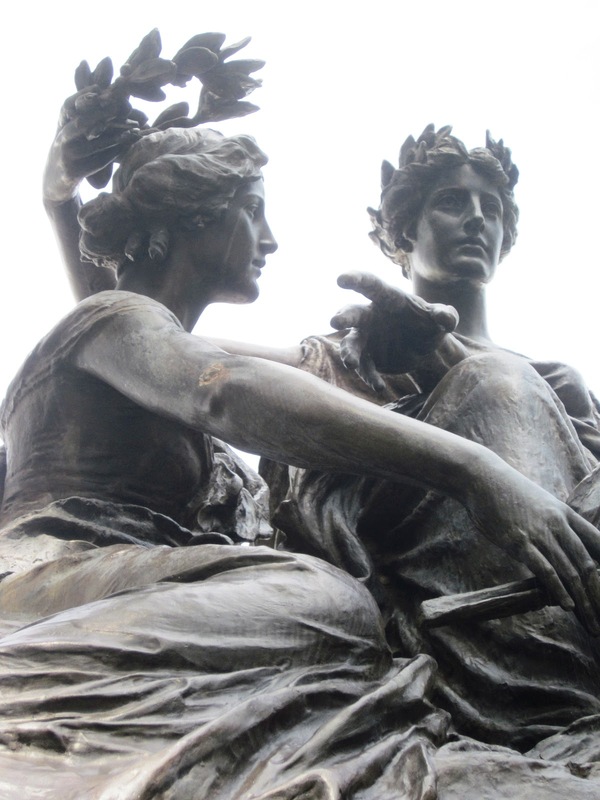 After considering dozens of proposals for a common design to be erected at each state capitol, a committee of veterans selected a proposal by Louis Amateis, an Italian sculptor. When the design, which featured a female figure striking a militant pose and holding a sword and flag, was presented at a Confederate veterans’ reunion in Memphis in 1909, the complaints were loud and numerous. The figure (above), the critics argued, didn’t reflect the grace and sentimental nature of Southern women and was too war-like. With this in mind, the committee went back to the well and selected another sculptor. This time, they chose a woman named Belle Kinney, a native of Nashville, Tennessee. Belle Marshall Kinney, born in 1890, was just seven years old when she won her first prize for sculpture at the Tennessee Centennial Exposition. In 1905 (at age 15), she earned a scholarship to attend the Art Institute of Chicago. She later served as an instructor at the Institute. Kinney received her first commission in 1907. When awarded the job of creating the “new” Women of the Confederacy Monument, she was still just twenty-three years old. Although the goal of the UCV was to select a design that could be used throughout the South, the model produced by Kinney (left) also failed to satisfy all of the critics. Unfortunately, her design – the sculpture ultimately selected by the State of Mississippi – was only placed in two locations: Jackson and in her hometown of Nashville, Tennessee. By the time the committee finally selected Kinney’s design, other Southern states had grown tired of waiting and decided to go their own way. 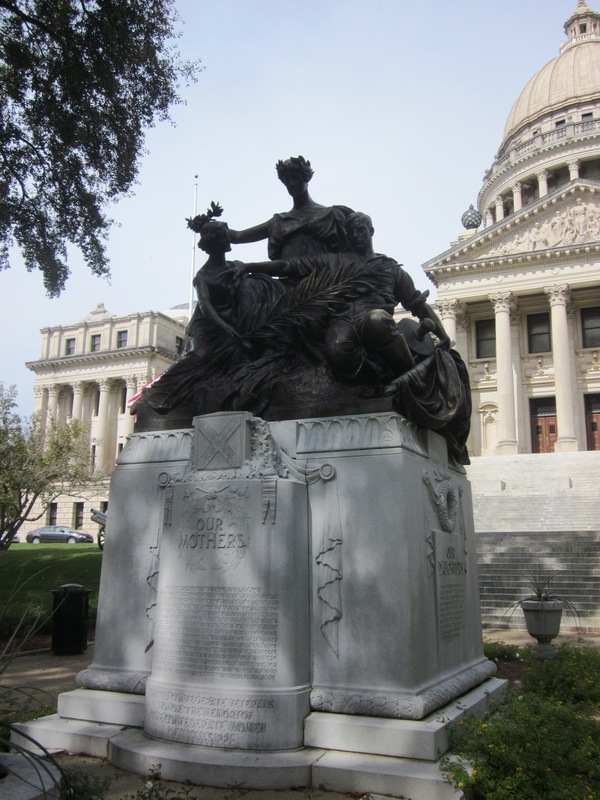 When the Jackson monument was finally installed during the state's centennial year in 1917 at a cost of $20,000, Mississippi was among the last three states to erect a monument to their Confederate women. Sadly, the Tennessee monument has been incorporated into a larger memorial plaza and has somewhat lost its original context and meaning. 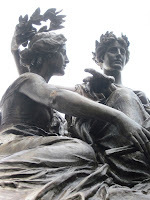 In 1921, Kinney married Leopold Scholz, a sculptor from Austria, and they collaborated on a number of significant works, including many of the statues at the Parthenon at Nashville’s Centennial Park. Kinney and Scholz also designed the Victory statue in the Bronx. Dedicated in 1933, the memorial commemorates the 947 soldiers from the Bronx who lost their lives during World War I. Kinney died in New York in 1959, but her work lives on in front of the Mississippi State Capitol. "And Speaking of Which..." is a blog about Mississippi history, concentrating on 19th Century, Civil War, communities and cemeteries, although any aspect of Mississippi and Southern history is ripe for the picking. Enjoy!